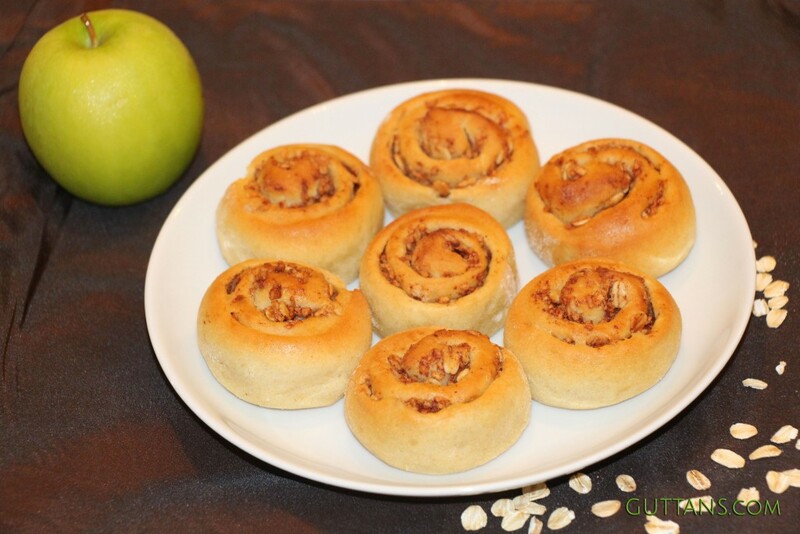 Apple Cinnamon Oats Swirls or Apple Cinnamon Oats Rolls is a variation on the classic Cinnamon Roll. It is made with a healthy addition of rolled oats and granny smith apple fruit filling together with cinnamon and sugar. Swirl burns are mildly sweet, scrumptious and soft. Apple – 1 cup (finely chopped 2 medium green apple). Squeeze out excess water with hands. Proof Yeast : Mix yeast with two tbsp of warm water and one tbsp sugar in a bowl. Cover the bowl and set aside for 10-15 minutes until it dissolves and blooms. Mixture becomes foamy or bubbly and frothy. Make Dough : Whisk together the flours and the salt. Make a well in the center of the flour mix and add the yeast mixture and warm water and knead (2-3 minutes in the mixer or 8-12 minutes by hand) till all the flour comes together into a ball of dough. Add the oil to the dough, half a tbsp at a time, and knead (6-9 minutes in the mixer or 12-18 minutes by hand) to get smooth dough. Usually, the kneading process takes about 8-12 minutes in a mixer, 20-30 minutes by hand and 1-5 minutes in a food processor. Proof Dough : Grease a large bowl with a tsp of olive oil, turn the dough in the oil so that it is evenly coated with the oil, and cover the bowl. Keep for 1 hour to 1.5 hour to double. Deflate and knead the dough for another minute until it makes a smooth dough ball. Make Apple Mixture Filling : In a bowl, toss all the filling ingredients except butter and mix it thoroughly. Set aside. Roll Out Dough & Add Filling: On a well-floured surface, roll out the ball into a rectangle. Add a thin layer softened butter. Spread the apple mixture evenly over it. Roll Dough into Log : Brush one edge of the dough with a little bit of water, which will aid in sealing the roll. Roll Dough into a log. Try to keep the sides of the log even as you roll. Press the moistened edge to seal the log. Pinch the seam to seal it well. Cut Dough into Rolls or Swirls : Using a sharp knife, cut the log into equal portions of 1¼ ” In well-greased baking tray, place the rolls cut side up. Make sure to leave gap between the rolls, because they will expand while they rest. Proof Swirls or Rolls : Loosely cover the rolls with aluminum foil or plastic wrap or keep inside a covered space (can keep inside any covered kitchen cabinet) or oven to proof. Let the rolls rise for about 20-30 minutes and in the meantime, pre-heat the oven to 175 deg C.
Bake Swirls or Rolls : Bake for about 10-20 mins till top of the rolls turns golden brown. Keep checking it after 10 minutes. All oven temperatures vary and so the cooking time too. Stop the oven once its golden brown colour. Once it’s done, keep in oven for another 5 more minutes. Butter Glazing : Take a blob of cold butter and rub it over the top of the freshly baked rolls. This gives the rolls a lovely shine and soft crust. TIME AND QUANTITY : The rolls in this recipe are cooked in top to bottom setting with oven rack in the middle position. Cooking time is 11 minutes (170° C) in Siemens & Bosch Oven and 18 minutes (175° C) in Fagor Oven. All oven temperatures vary and so the cooking time too. This recipe makes 12-15 rolls.